Do you feel like you've tried numerous diets with limited success? It might be time to try another approach. 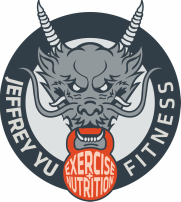 At Jeffrey Yu Fitness, I provide online coaching built upon the most up-to-date principles of exercise and nutritional science with an emphasis on calorie tracking. This approach has a rigid structure yet provides flexibility with the foods you eat. With calorie tracking we create an understanding of how food composition affects the body and why the quality and quantity of nutrients matter. It may seem like a daunting task initially, but as we lay the educational foundation and create dietary habit changes, you'll find weight management much easier and more liberating. In addition to the nutritional coaching, I provide an outline for exercise and cardiovascular work. Each program is centered around your unique goals, lifestyle, and schedule. You will learn how to become flexible with your diet while maximizing your efforts in the gym. I provide guidance, support, and personal interaction to help you succeed. If you commit to the work, I guarantee I can help you reach your goals in the most efficient manner. Take the opportunity and email for further inquires.